Derogatory Credit Marks – How Long Will They Be On My Credit Report? Derogatory credit marks can hurt your chances of getting a home loan approved, and in these times when buying a home and getting your loan approved is no small challenge even if you have great credit, I thought it might be helpful to see a detailed breakdown of what the waiting period is for various types of loans with derogatory credit marks. Click on this image to enlarge it. 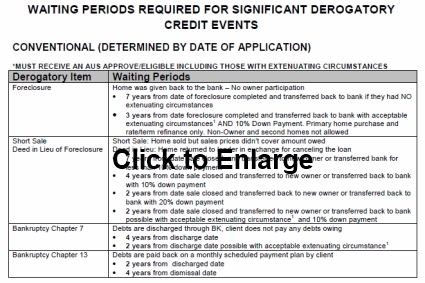 Enlarge this image and view the entire list of waiting periods for various types of loan. If your browser opens it with small print that is hard to read, simply zoom in with your browser by holding the “Ctrl” button and hitting the “+” key several times. Special thanks is owed to my friends for preparing this detailed list of derogatory credit marks for me: Eric Gausepohl & Matt Gausepohl at www.SummitLendingServices.com. If you do have some of these derogatory credit marks on your credit report, don’t give up hope. Talk to a sharp loan representative who is knowledgeable, experienced, and professional. Now more than ever, experience in your loan officer is critical to addressing complex issues that could kill your loan. Underwriters seem to be looking for any reason to turn the loan down, so pre-qualifying is more important than ever. If I can help you buy your home in Sequim, Washington, and get connected with a loan expert who can help you do some pre-qualification work, email or call me. I’d be glad to help. Derogatory credit marks can kill your chances of getting a loan. One Response for "Derogatory Credit Marks – How Long Will They Be On My Credit Report?" Thanks for providing that credit report with the remarks included. It would be easy to feel powerless if these remarks were on your report and just give up. Good to know that some loan officers will not be deterred by these.